This interactive visualization is supposed to help players see that critical trade-offs are needed to reduce our carbon emissions, however, this oversimplified model has the unfortunate effect of making those trade-offs seem almost trivial. My2050 is no SimCity 2000, nor does it pretend to be. It knows that it is neither a deep nor a complex simulation of the world, or of the relationship between man and global environment. Instead, this little simulator positions itself as a humble little tool designed to make more "open and transparent" the issues involved in contemporary discussions of reducing global CO2 emissions. But does this simplified model of how human activities impact the environment ultimately obscure more about climate change than it reveals? Unfortunately, I think the answer is "yes." 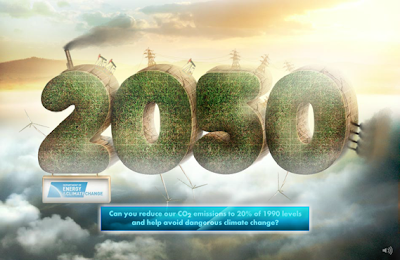 The point of My2050 is to develop a strategy for reducing carbon emissions in the year 2050 to 20% or less of the emissions produced in the year 1990. Speaking of the year 1990, it seems a rather fitting coincidence then that this simulation is actually highly reminiscent of a 1990 DOS game called Balance of the Planet. 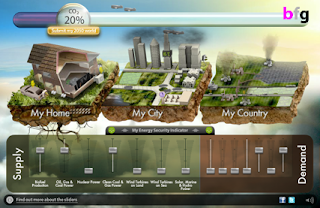 Both games are essentially models of the relationship between various economic and social activities of man and their lasting effects on the global environment. Using sliders, players adjust just how much resources mankind should put into various activities in order to produce desirable long-term effect. In Balance of the Planet, players could make investments that covered a fairly broad spectrum of human activities: players could raise and lower the tax rate on pesticides or logging, or they might decide to allocate money toward building recycling centers. In My2050, the activities are much more specific. For example, there is a slider to lower average home temperatures, and two separate sliders for building wind turbines based on whether they will be built on land or at sea. The specificity of My2050 reminds you that the goal of the simulation is incredibly narrow: carbon emissions are the only index of environmental health relevant here. But why compare two games separated by over 20 years of development in the environmental simulation genre? Because the truth is that newer isn't necessarily better. My2050 is by far a graphically superior spiritual descendant of Balance of the Planet, but it is also based on a drastically more simplistic environmental model. That simplicity gives My2050 the advantage of being much more broadly accessible than Balance, but it also makes the relationships that it posits much less meaningful. My2050 also goes on to replicate one of the weakest features of Balance--the limited amount of player interaction involved in the gameplay itself. This lack of interaction only further detracts from the educational value of My2050. Balance of the Planet was a game that catered to a fairly niche market, and the complexity of tracking 150 different variables as indicators of global health posed a daunting challenge to players. My2050, on the other hand, is simple to a fault. The specificity of the problem that My2050 addresses belies the complexity that characterizes global environmental change. Even though the developers acknowledge the model's simplicity, they don't acknowledge how such simplifications might actually detract from our conversations about long-term environmental health. Balance understood (and made players understand) that environmental and economic health go hand in hand. Governments have to invest in solar energy research if we want to see efficient solar panels on the roofs of every home. But where will that money come from? Reducing subsidies to the oil industry or raising taxes on homeowners? Both choices have consequences, but these are exactly the hard decisions that have to be made to reduce carbon emissions. In My2050, however, these hard decisions have been eliminated from the equation. The "resources" that players invest by adjusting sliders are completely abstract, to the extent that managing theses is next to meaningless. What is the real cost of adding more wind turbines? The simulation may warn a player that planning to build 40,000 new offshore turbines requires "High Effort," but what does that really mean? How much less effort does it take to build next highest level on the slider, which orders the production 17,000 turbines? And why should "effort" be a disincentive for building them? Players are given no concrete answers to any of these questions, which seems to make it trivially easy to say, "Duh! Build more wind turbines and reduce coal power plants. Carbon emissions problem solved!" If only it were that easy. My new world still looks sinisterly smoggy. A second critical weakness in My2050 is that the pleasing graphics do little to compensate for the minimally interactive experience of moving sliders around. In both My2050 and Balance of the Planet, the reliance on sliders to produce effects in the simulated world makes players feel like they are only vaguely participating in that world. Now when Balance was released, Windows 3 was the hot new operating system and floppy disk drives were still standard issue. But even then, Balance's actual gameplay was notably unsophisticated when compared to other 1990 releases, like SimEarth. Yet it's easy to forgive a game made before the CD-ROM revolution for being thin on the amount of player interaction, particularly when it considered the under-the-hood complexity of its simulation to be of greater value. However, My2050 is a product of the 21st century, and I think the time has past when "slide this, watch the pretty picture change" could be considered a meaningful mechanic for engaging audiences. Don't get me wrong, I do like that there is some immediate visual feedback in My2050. For example, anything that reduces carbon emissions makes the clouds of black smog fade from the simulated sky. And power plants, turbines, and the like appear and disappear on the screen as players make adjustments. But the action of adjusting the slider is nevertheless fairly detached from the meaning of that action. How does allocating more resources to biofuel impact CO2 levels? Are there consequences, visualized or not, to my booting the biofuel slider ever upward? If the purpose of the simulator is to help player understand how to curb carbon emissions, then doesn't it seem like the game show teach more about how each variable produces that change? Otherwise, curtailing carbon emissions seems like little more than a numbers game, and I'm simply holding the abacus. By my calculations, to reduce CO2 emissions we will need precisely 8000 sq. miles of biofuel, 10,000 turbines, 13 nuclear power stations, and a partridge in a pear tree. Blow, blow the smog away my lovely wind turbines! Related to this problem is the mystery behind why adjustments to each slider have the effects that they have. In Balance, part of the challenge in understanding the impact of your policies lay in the fact that each single variable that the player manipulated could set off complex interactions between interrelated variables. Complexity was enemy of transparency, and players couldn't avoid feeling a certain sense of helplessness as they played. All it took was one overzealous attempt to reduce reliance on fossil fuels to inadvertently raise global food prices and create famine. My2050, however, has significantly less complexity, yet the impact of the players' manipulations of each slider is still far from being transparent. I found that putting the "oil, gas, and coal" slider on it's highest level often resulted in fewer carbon emissions than having it set at a lower level. For example, when I added wind turbines, highest slider level of fossil fuel use resulted in 64% emissions, whereas lowering fossil fuel use one level resulted in 70% emissions. 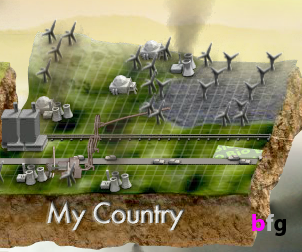 Is this simulator really trying to tell me that we shouldn't reduce our use of fossil fuels if we build wind turbines?! Likewise, insisting that businesses green up their act has a trivial impact on CO2 emissions when oil, gas, and coal levels are at their highest. But drop fossil fuel production one level on the slider and the impact of business greenness nearly doubles. Maybe the game developers tried to leave room for the effects of synergy, but the more unpredictable the effect of each slider are, the harder it is to know what to change and why. Other mysteries include why adding nuclear power plants lowers CO2 emissions even when you have fossil fuel use set to its lowest level (do nuclear power plants produce negative CO2 emissions? ), why there is sometimes no difference in CO2 emissions between using 10% fossil fuels and 50% fossil fuels, and why raising the amount of home heat supplied by electricity from 0% to 20% actually lowered the demand for electricity. If the goal of this simulations is to create transparency about the contributing factors to carbon emissions, the game seems to fail spectacularly. Balance of the Planet creator Chris Crawford summed up the problem nicely in 1991: "Environmental problems exist because they're difficult. If environmental problems were easy, we would have solved them by now." And this is the critical point which My2050 strikes out on entirely. It is amusing to spend 10 or 15 minutes playing with the My2050 model and seeing what kind of emissions-free world you can create, but what you learn from this model shouldn't be used as the basis of anyone's master plan for reducing carbon emissions. Kids could easily leave the game satisfied in the knowledge that they've "saved the world" by setting all the sliders to the exact opposite of their starting conditions, but they won't know the cost of their new world order, economically, politically, socially, or otherwise. Younger players should definitely be provided with external guidance from a parent or teacher so that they might understand why stopping climate change isn't as simple as adjusting a slider suggests. With a contentious issue like climate change, gross oversimplifications do little to advance to the conversation, and My2050 lacks sophistication in too many critical ways to truly function as a helpful visualization of our current carbon emission problem. Note: Balance of the Planet has been classified as abandonware. You can download the game here and play it using a DOS emulator.